You Are Here is an ode to urban dwellers, the millions of citizens who live on top of each other, participate in the daily pedestrian dance of the sidewalk, street, and transit system, and who are part of a massive improvised narrative. It explores how we interact without looking at or touching each other, how we recharge at home each night, and how we head back onto the city’s stage again each morning, ready for more. 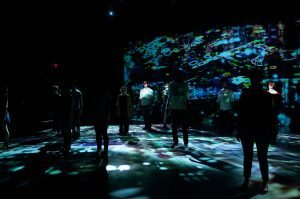 You Are Here premiered June 16 – 18, 2016 at the Kitchen, NYC. 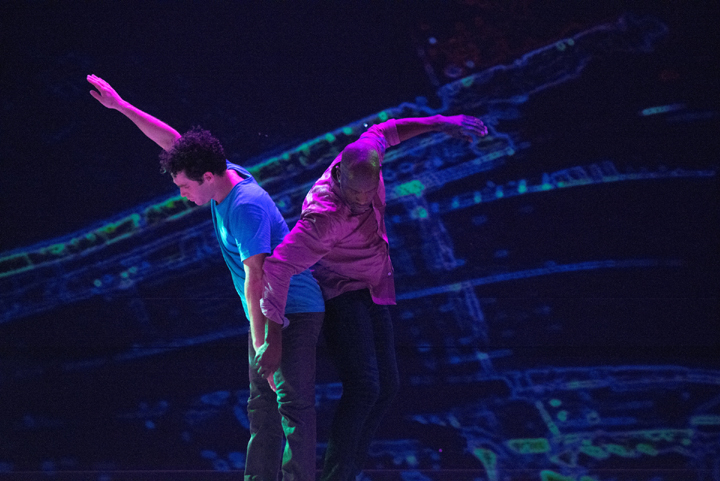 It was presented by the American Dance Institute in their series ADI/NYC. 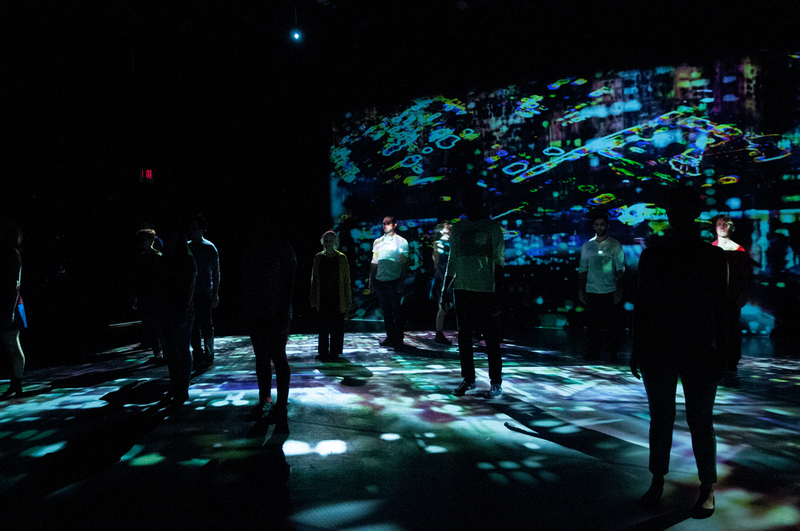 Jane Comfort’s newest work is a collaboration with sound designer Brandon Wolcott and lighting designer Joe Levasseur. In a radical departure from her career history of narrative dance theater works, Jane has explored a work generated by visual, kinetic, and sonic ideas rather than a narrative storyline. The movement references the evolution of animals, social structures, or codes, beginning with a stark landscape and ending with a highly physical and complex group movement climax… Joe Levasseur’s lighting evokes both nature and machinery and plays with contrasting visions of immensity and containment. Brandon Wolcott’s sound design explores the relationship between expressionistic experience and the subconscious. 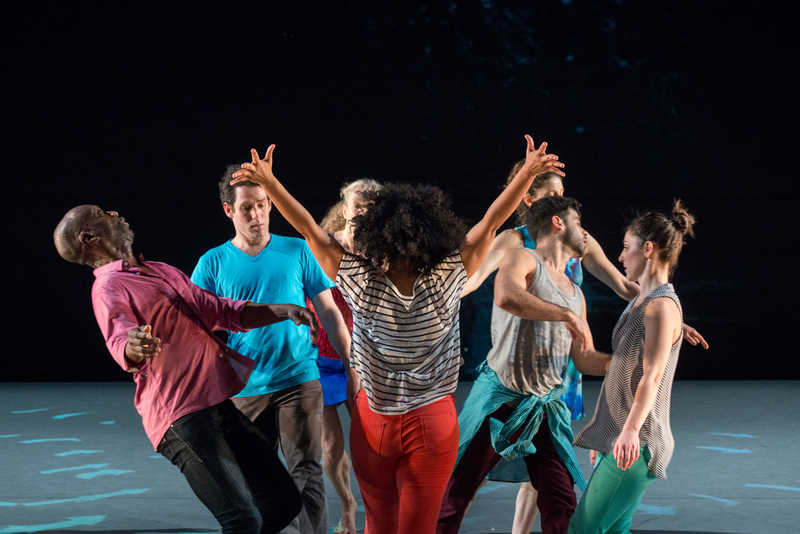 The one hour work for seven dancers premiered at La MaMa E.T.C in May, 2015. Underground River, winner of the Bessie Award as a “risk-taking and profound theatrical tour de force,” is a dance/theater work that explores the rich inner life of a girl who appears to the outer world to be unconscious, or comatose. Originally produced in 1993 at PS122(NY) and the presented Off-Broadway at the Classic Stage Company (NY), Faith Healing takes the story line of Tennessee Williams’ The Glass Menagerie as its point of departure. The issues of nostalgia, regret, fantasy, hope, anger, and unrequited love addressed in The Glass Menagerie are given a vivid and fresh examination through Comfort’s perspective of movement and performance theater. Additionally, the play’s themes of fantasy and nostalgia are embodied by multiple escapes into contemporary pop culture. In 2018 Jane Comfort and Company will celebrate its 40th anniversary, an extraordinary achievement for an experimental downtown New York dance theater company. The company plans a retrospective concert of excerpts from iconic pieces, with past company members participating, and a new work with the current company. JANE COMFORT is a choreographer, writer, and director known for issue-oriented works integrating text and movement. Since 1978 she has created over 50 dance/theater works, most of them evening-length, that have been presented throughout the United States, in Europe, and in Latin America. Recent works include Beauty, a dance theater work about the cultural pressures surrounding women’s physique, attire, and appearance; An American Rendition, commissioned by NPN and NYSCA and voted a Best of 2008 Performance by both WNET Sunday Arts and Gay City News; Fleeting Thoughts, commissioned and produced by Danspace Project, with live music by Joan La Barbara, as well as commissioned new works for Ballet Memphis, Jeanne Ruddy Dance, Headwaters Dance, Rhode Island College and G2 Dance in Brazil. She received a 2010 Guggenheim Fellowship for the creation of a new dance work, Beauty, a BESSIE Award for Underground River, a Collaboration Award from the Coalition of Professional Women in the Arts and Media in 2006 for her collaboration with composer Joan La Barbara on Fleeting Thoughts, a Doris Duke Award for New Work through The American Dance Festival, and a Habie Award for distinguished service to the arts from the University of North Carolina in 2003. She has received 15 NEA fellowships and grants (1979 to 2012), four National Performance Network commissions, multiple NY State Council on the Arts grants over 20 years as well as support from Department of Cultural Affairs, Creative Capital, NY Foundation for the Arts, American Music Center, Mary Flagler Cary Foundation, Meet the Composer, Fund for US Artists , BUILD, Altria, Arts International, La Red, New England Foundation for the Arts, Rockefeller Foundation MAP Fund, JP Morgan, Harkness Foundation, Bossak/Heilbron, and other organizations.